The Sigma II Amplifier is the ultimate servo solution for your automation needs. A single platform covers 30 watts to 55 kW and input voltages of 110, 230 and 480 VAC. The Sigma II amplifier can be set to torque, speed, or position control. A single-axis controller and a variety of network interface modules can be attached to the amplifier for the utmost flexibility. The Sigma II amplifier utilizes serial encoder technology to automatically recognize Sigma II rotary and linear servomotors. Advanced algorithms provide high performance tuning and suppression of machine resonance. 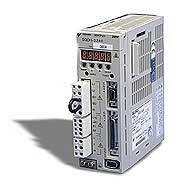 A built-in keypad and serial port allow easy set-up and monitoring of the servo system. SigmaWin and SigmaWin Plus software can be used to capture torque, speed, and command references and SigmaWin Plus Professional can perform FFT and machine simulations.